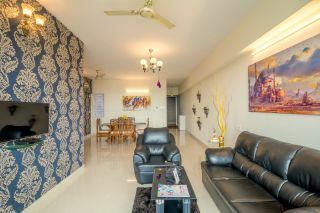 This is an offering of a three-bedroom apartment that is ideal for large groups. This chic apartment can accommodate up to nine people. Breakfast is provided here. Ample parking space is available for those on a road trip. 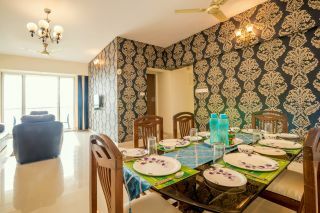 Your Space Designed with a contemporary theme, the apartment on offer flaunts stylishly decorated interiors. 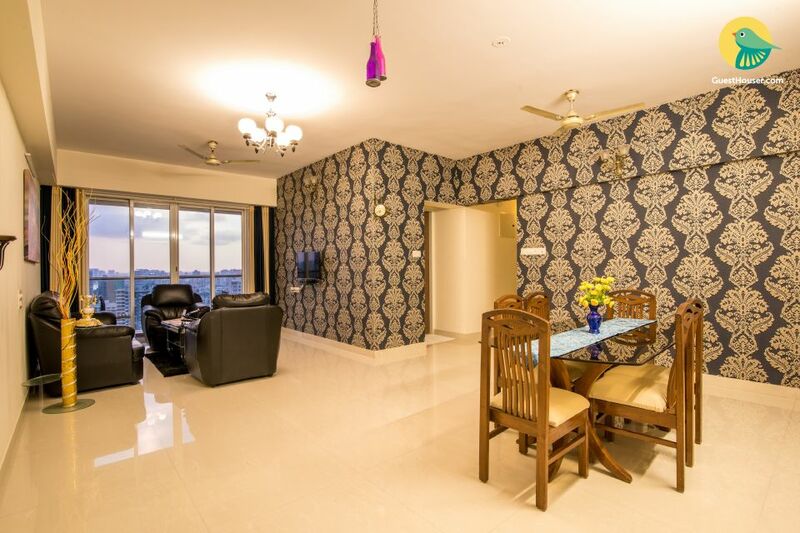 The living room features a striking wallpaper with a geometrical design on one of its walls. 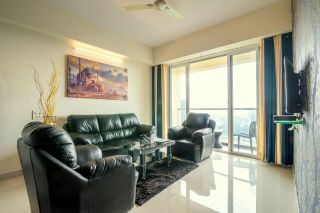 Plush sofas along with a coffee table placed here make it the perfect lounging spot. The seating arrangement faces a flat-screen television, so you can keep up with your favourite shows even while on holiday. 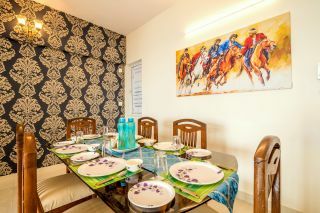 A six-seat glass-topped dining table is provided in the dining area for mealtime convenience. This space opens out to a balcony that commands a spectacular view of the cityscape. 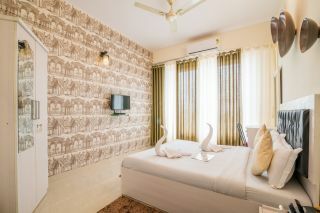 The bedrooms are done up in similar style, each adorned with a wallpapered accent wall. Each room is furnished with a comfortable bed, a mirrored wardrobe, a vanity unit, and a work desk for added convenience. 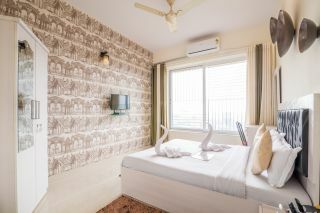 The well-designed bathrooms are equipped with modern fixtures and western sanitary ware. Guest Access Feel free to spend leisurely time on the terrace when you are not in your room. Guest Interaction The host will send someone to hand over the keys to the guests at the time of check in. Neighbourhood Overview Gateway of India is located 41.2 km from the property. These are some of the other attractions that guests can explore: Elephanta Caves - 41 km Marine Drive- 31.7 km Juhu Beach - 19 km Getting Around The property is located 33.6 km from Mumbai Central Railway Station, 1.7 km from Borivali Railway Station, and 1.8 km from Borivali Nancy Bus Stand. Additional Information Guests are required to provide a valid ID proof at the time of check in. Families and married couples are welcome here. We do not host local residents and bachelors. The host regrets any inconvenience this may cause. Please refrain from playing loud music.